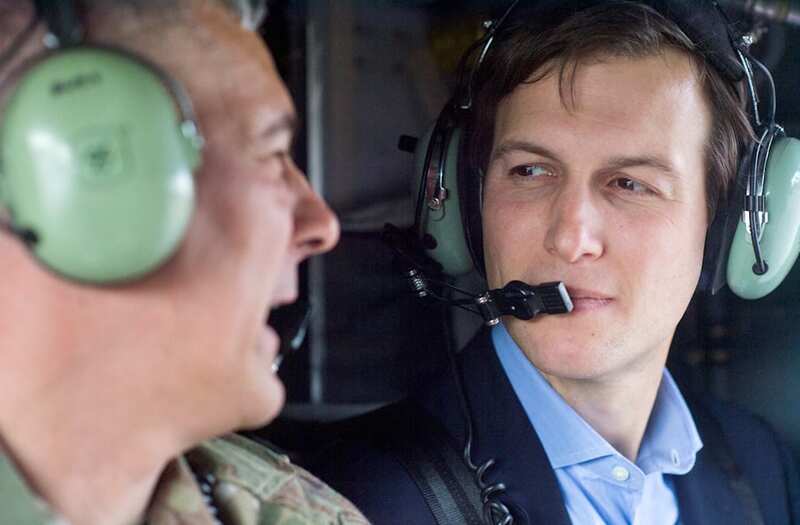 Jared Kushner, President Donald Trump's son-in-law and senior adviser, arrived in Iraq on Monday with Joint Chiefs of Staff Chairman Gen. Joseph Dunford to meet with Iraqi Prime Minister Haider al-Abadi, Iraq's minister of defense, and US military officials. The administration has been accused of breaching standard practice by sending Kushner as the first senior Trump official to visit Iraq, rather than the secretary of state or the national security adviser. The White House also faced criticism after it announced that Kushner was in Iraq while he was still en route, creating a potential security risk. The government continued to publicize the trip with a series of photos of Kushner riding in a helicopter above Baghdad, meeting US soldiers at a forward operating base, and meeting with al-Abadi and the defense minister for discussions about the fight against the Islamic State. Kushner is featured in half of the 61 photos released on Tuesday on the Joint Chiefs Flickr account — the same amount that feature Dunford.